Wait, you’re a bakery but you made latkes? Last night the RBI Cakes crew volunteered their time for the 3rd Annual Latke Festival Sponsored by our friend and colleague, Liz Neumark of Great Performances. People were lining up at the latke stations in the BAM Café in Brooklyn, enjoying the various chefs’ take on this holiday tradition. Ron of course brought his own traditional spin to his holiday favorite – he ads a bit of shredded parsnip to his pancake. And to give it a bit of a sweet taste (we are a bakery after all) – a sprinkling of sugar and brûléed with a torch! 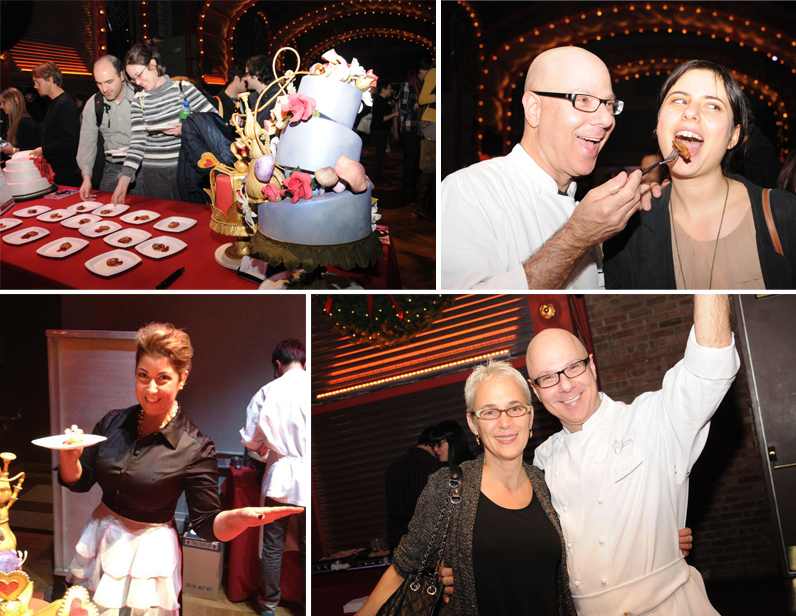 The event took place in the BAM Center Cafe at the Brooklyn Academy of Music. In the middle photo is Ron and his staff before the event begins. The photo on the right is Robin testing our her brûlée torches. Ron’s Parsnip Latke Brûlée was a lovely and tasty addition to the latke's of the evening. We plated ours with a baked apple sauce and cranberry-orange sauce. Peel potato and coarsely grate into a bowl. Add lemon juice and toss to combine. Place grated potato on towel, then gather up corners to form a sack and twist tightly to wring out as much liquid as possible. Stir potato together with parsnips, flour, eggs, chives, salt, and pepper until combined well. Cook in vegetable oil about 1 ½ minutes on each side. Before serving, sprinkle with granulated sugar and torch to caramelize. Starting Top Left: Guests' coming in for an RBI latke. Of course it would not be an event if Ron wasn't feeding the guests! I helped the staff serve up 600 latkes. Ron and the lovely Liz Neumark of Great Performances. ← There are fruits and veggies on that cake….